Remember my big white orange? It’s still white … But I haven’t been ignoring the project, I’ve just been doing what is for me the most important part of any creative endeavor: Thinking about it. I’ve also been looking at RAM’s Art Alliance Giant Orange website from 2006 (click here), in the hope of finding inspiration. I might’ve found some, too, if I hadn’t become distracted by the fact that back then they had a t-shirt … and this year’s event didn’t. 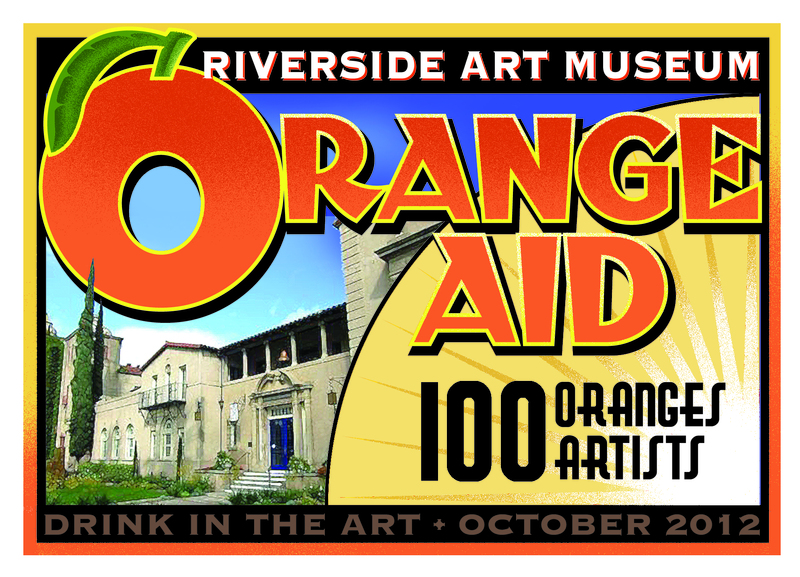 So, I had the idea that I would create a design for 2012’s OrangeAID benefit and offer it to the museum organizers as a way to promote it … and maybe they would even use it on a t-shirt. I’d been surprised with a new iMac desktop system for my birthday on the 7th (from guess who? ), and I had lots of free time between painkiller-induced naps … what did I have to lose? NOTE: I asked Kathy if they were still accepting applicants for OrangeAid and she informed that there are a dozen yet unspoken for. If you’re a local artist and interested in getting in on the fun for RAM’s benefit, click this link for more information and to apply. Go for it! Thank goodness they had the smarts to accept your fabulous gift and run with it! Very cool. It’s been too long since I spent any time at RAM. Years. Have often wanted to take some classes in an effort to get myself started again. Also used to swim there as we lived down the street from there. Wow, I love the idea of swimming at RAM; was that in the atrium, under the central skylight? … Re: classes — I should probably take a class or two myself … let me know if you go, Vickie. My biggest problem with taking these classes is that I can’t afford the cost. The ones that seem to interest me are ranging from $150 to $175 or so. That is if I’m remembering right. So I imagine that it will be a while before I can do this. I haven’t taken an art class since high school. It might be a little spooky. Even if I can find the funds. One can always dream. Eek, I didn’t even think about the cost, but I have heard there are free classes, too. I have to admit I fear a classroom situation, too …. it’s been a loooooong time for me! Didn’t know about any free classes. Just my speed. With that kind of cost you and I wouldn’t feel bad if it didn’t seem like the right “fit”. I do believe that alot of the attraction is to get back to that learning of something new or even the ones that would remind one of a method that once pleased the artist in a person. And there are so many different ways to express oneself. I’m blathering on again. Good night! Late night blathering is a good thing! I’m glad that someone thinks so. Most will tell me to slow it down. Or to get to whatever point I’m heading to. If there is one. But I do believe that in the process of blathering I am working my way to where I need to be. Does this make sense? It’s one of the things that I do, especially when I am trying to find whatever is in the back of my mind and I can’t quite find it. With all that’s gone on in the last few months i’m not too surprised at myself. Thank you for understanding. Not all folks understand what it is to blather. Blather, to me, is merely thinking out loud … and how could that be wrong?! Thank you ever so much for your understanding. I agree about the thinking out loud part. Even if it is by typing…Sometimes, as my Mom used to tell me, I think it is the artist soul trying to figure out where and what is trying to come out. Gram used to tell me it was just me being myself, whatever that is. I will always be looking for the way to express myself, be it with my recyled planters or with another medium. I just go about it in my own weird fashion. And as always, trying to find the way to laughter thru the process. Great Mom and Grandma: lucky you! Yep, they were both pretty special. When they weren’t scolding me for basically being somewhat of a hippie girl, they were encouraging me to try my wings. Even when they decided that they didn’t particulary like where I was flying to. They taught me so much. They are greatly missed. They are the ones buried across the street from you and Paul. ( by the way, tell him Hello for me!). Reuben, this came out beautiful! I hope they make t-shirts… I would for sure buy one, and then I’ll have you sign-it (smile). Hiya, WF … here’s hoping!